Every time we travel, I always try to find a local market, preferably an outdoor farmer’s market. To me, this is fantastic way to sample the local specialties and find the hidden gems. Prices (usually) are better than at some store where the shopkeepers also have to cover rent, labor costs, etc. In Munich, Jason and I discovered the joys of the Viktualienmarkt, located just south of the Marienplatz. (From my prior research on tripadvisor.com, it sounded like this area was going to be the best place to do some food shopping.) This is Munich’s oldest and, in my opinion, very picturesque market. As soon as we turned a nearby corner, we passed this butcher shop. The front window was filled with all kinds of meat, especially pork. I was in heaven! Since the weather was cold, dreary and rainy, our first stop happened to be at a darling honey shop called Honighäusel. Inside, we were awed by all the different flavors of honey. Ones from different types of flowers such as clover, thyme, rose and fruit tree blossoms. Others were flavored with pieces of herbs, spices and even chocolate. In the end, I settled on just two jars of honey – ginger and thyme. We ordered 2 glasses of hot Honigwein – a sweet alcoholic beverage made from honey and water. It wasn’t even noon yet, but it was chilly! We started talking to an older German gentleman whom entertained us with stories about Munich and how when he was a young man he had lived in New York City. After the wine, we stopped at Lupper, which seemed to specialize in Italian cured pork products. I bought 150 grams of Pata Negra Jamon Iberico, 100 grams of thinly sliced, spicy hot chorizo, a package of chorizo links and a nice chunk of Valdeón – a Spanish blue cheese. and it’s all stored in our freezer right now. Rows and rows of Speck which reminded us of a saltier type of bacon. In addition to the meats, cheeses and other gourmet foods, there were several stands selling local produce. Since we were staying at a hotel, I just wandered among the stalls and took some photos of the colorful seasonal vegetables. By the end of our shopping trip, I had spent nearly 100 Euros on European cheeses, honey, mustards, spices and pork. I’d happily return to this market any day! We also sampled several kinds of German mustards. Here are the German mustards and honey that I brought back to Istanbul. Salivating over all this food made hubby and me hungry. We strolled over to a nearby restaurant to order some German Weißwurst and beer. Great post, glad to have you back! Sounds like you had an amazing time. Did all your purchases fill up your suitcase? Sounds like you had an amazing time. Augh the memeories of Germany come flooding back after reading this. What other trips have you planned for this year? Wow, when can I come for dinner! Panda and Steph: I would have loved to buy more but we only had so much space (unfortunately) in our hotel room's small fridge to store our purchases! Later in March, we head to London to celebrate our 1-year wedding anniversary. Hopefully, we can return to Germany later this year as there are often cheap flights from here. Just read all your pork posts. So good! Our mouths are watering. This post really took me back. I lived in Turkey a few years ago, and I had to travel to Bulgaria every now and again. EVERY time I went, I stocked up on pork products! I had been living in Croatia, and had not realized how dependent on pork my diet had become. Thanks for sharing -- I'd forgotten all about that. @Rosa, LOL. 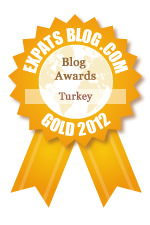 Ask nearly any expat here in Istanbul and they all bring back pork in their suitcase. :-) We sometimes bring back American PB, maple syrup and baking supplies too.